The most visited post on my blog is "My Baby Storytime". After almost 2 years in La Crosse, I've made a lot of changes though! Here is the new and improved version of how I facilitate my infant and baby storytimes. Room Setup– Blankets and pillows really help contain little ones and make the parents more comfortable too! My song sheets are directly behind me so no parent has to figure out the words to the songs. I sing the same songs every week, so usually by week 3 they have them all memorized. At the beginning of each new 6-week session I will usually introduce a new rhyme or two and rotate out others. This keeps the content fresh and helps me not stab my eyes out from singing the same 10 songs for months and months. For my 1 year old storytime I use a slightly different set-up. The pillows and blankets are just tripping hazards for their unsteady toddling and I need more space for the group. I used 10 spots for this picture, but I usually set down 16 of them and have a wider circle. I set down these small cushions only for the first session. If I put them down each week kids will eventually start fighting with them and it becomes a huge distraction for some. Setting the room up the first class helps everyone understand the shape I want them to sit in, and is worth the headache for the first session. I've tried simply telling the caregivers to sit in a half-circle and they all seem to forget what it looks like if I don't do the cushions at least once. Nametags: I still hand these out as the caregivers and babies are walking in. This helps me memorize their names and get a count for how many are in attendance. I remind caregivers to stick nametags on their child's back so they can't reach them. If your class is small enough, make a nametag for the parents too! My Introduction: I always start each session with a welcome. For the first two classes of a session I will also explaining the timeline of what will be happening. "Welcome to Storytime! My name is Miss Brooke and I'm so excited to see you all today. We're going to read great books and sing a lot so everyone get your singing voice ready! All of the words to my songs are on the wall, so please sing with me because your baby loves to hear your voice. If your little one is having a rough day feel free to step out and come back if you can. If you need to leave early I promise I won't be offended. Just come back and try again next week. Is everyone ready?" Timeline: "Storytime usually last about 15-20 minutes. We always start about 5 minutes late to give everyone enough time to come and settle in. Once storytime is over I will throw out book and toys and you all can stay and play! This is a great time to make new friends and have some one-on-one time with your little one." Caregiver Introduction: The first few classes of a new session I also go around the circle and have my caregivers introduce themselves, their child, give the child's age, and a fun fact about them. The fun fact can be stressful for some caregivers at first so I always say, "You can tell me something they love or something they hate. Tell me about a milestone they just hit or just something you just really want me to know about them!" I start out the exchange with my name, how long I've been in La Crosse, and a fun fact about myself. This helps break the ice because I always make it super ridiculous. The introductions combined with the nametags make learning names much easier for me. Books: I have changed the way I approach books in infant and baby storytime. I used to go into storytime with a plan for 3 books. This is WAY too much in my opinion. I did it this way because that's what I read on a lot of other outlines and in different books. I stuck with this for about a year before I realized I was making reading a forced activity. Yes, I would still have a few kids by the third book but the majority were lost. I now do one book as a reader and the group does one book with me for choral reading. Two books for the entire storytime. The rest is singing, talking, dancing, and rhyming. This has made the storytime experience a much more enjoyable one for both myself and the participants. Playtime: Are you playing at the end of your baby storytimes? If not, start immediately! It is such a great time to make those bonds with caregivers and to encourage and model play with their babies. For a list of toys I use check here. I always put a stack of books out first and then my toys. If I have a storytime immediately after one group I will put my clean-up bin down 15 minutes before the next class. If there is no group in the programming room after then I let them stay as long as they want. I also stopped handing out bubbles to my parents. They were such a headache. They spilled everywhere, parents didn't really want to use them, and kids wanted to just drink them. Instead, I took the genius advice of Kendra from Read, Sing, Play and bought this bubble blower from Gymboree. Stop whatever you're doing and buy this immediately. You basically become a bubble machine. The kids will flock to you which is nice for the parents who want a moment to catch up with their storytime buddies. Plus you get a lap full of babies! Organization: I started storing my toys in plastic bins. This keeps kids from losing focus during the storytime. I also have the book I'm reading and the bubbles (ignore them in this picture) hidden in my tote bag. Keeping my table more organized has really helped with the overall chaotic-ness of storytime. I know exactly where everything is and the kids can't grab anything off the table I don't want them to have. Invest in plastic bins. Cleaning: I use Lysol wipes on everything after my storytimes. I take the pillow covers and quilts home every other week to wash them. Any item I give to the babies, I assume they will try to eat so I plan accordingly with how I'm going to clean it before my next class. Final Thoughts: This is simply what I do. Maybe you read 5 books every storytime and love it. Maybe you read and sing the same books every single storytime. Maybe you think you storytime is the best and you are never going to change it. My challenge to you is to ask yourself- Do your kids and caregivers love it too? Are you reading all 5 books simply so you can say you read 5? Are your caregivers starting to roll thier eyes when you announce it's time for The Itsy Bitsy Spider. Have you had some caregivers who have heard the same books and songs for multiple years? Please just stop and reflect about your storytimes. If you're struggling to plan or not enjoying them as much as you once were then it's time to change it up. Try only reading a few books. Try singing more and using different songs. Use CDs. Try whatever you want, but simply try something different. As our dear friend Albert Einstein said, "Insanity is doing the same thing over and over and expecting a different result." Don't let storytimes drive you insane! I hope it is one of the most enjoyable and rewarding parts of your job. Need to talk about it or have questions? Email me at berasche at gmail dot com. WLA 2014 - ALL THE THINGS! I had a fabulous time swooping into the Wisconsin Dells (Wisconsin's own little Las Vegas) this past week. I would highly reccommend that everyone go and check their state association out. While I love ALA, it's really lovely to go to a conference where the majority of people you meet are within driving distance. It's also really refreshing to see how many amazing things are happening in your very own state! We have some amazing people in Youth Services in Wisconsin. Go join the Youth Services Section if you're already a WLA member. If you're not, then definitely become one. If you don't live in Wisconsin, then just move here. Totally worth it, I swear. The safari-themed hotel really helped set my mood for the conference. For the record, I am not being sarcastic. I truly loved the outrageous hotel. I know people thought it was outlandish (it was) and over the top (absolutely), but I loved it. I loved the stupid lobby music, all the little shops, restaurants, and tourist trap places. I would go to the Dells on a monthly basis if I had the vacation time! So there. I had the pleasure of presenting two different programs while at WLA. I was lucky enough to present with some of my favorite colleagues Linda and Sara. We decided to be as ridiculous as possible and Sara made up a Chuck Norris themed presentation. I'll include the slides because they're amazing. Unfortunately, you'll literally get nothing from the slides other than laughs. We did give really great information though and you can get all the info about our tours FIELD TRIP ADVENTURES! here here and here. Sara is a genius with slide decks. Next, I presented with two lovely women, Tiffany Meyer and Ann Hardginski, about preschool programming. We wanted to encourage people to break out of their storytime ruts, and try new things! Throughout the presentation we talked about a variety of different programs and our crowd had great questions. The slides are included below. If you have any questions about a specific program email me and I will forward it on to the right presenter. For part one of this post go on ahead over here. Once our new and improved Play and Learn area had been up for about a week, I knew there was more we could be offering our patrons. 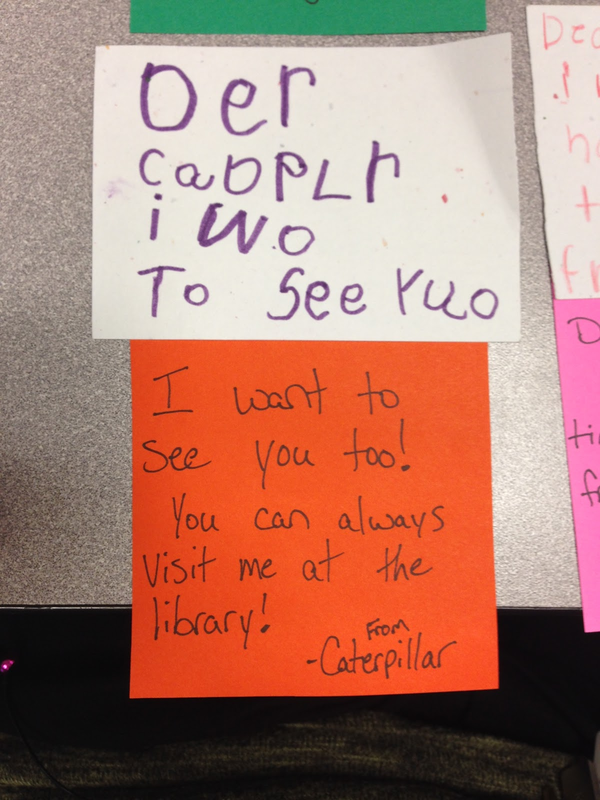 While they absolutely loved the mailboxes and delivering letters, I realized they would also love WRITING letters to their favorite characters. Our amazing aide made our bulletin board directing kids to ask for supplies at the desk. Since I'm a huge failure I unfortunately didn't take a picture of it. 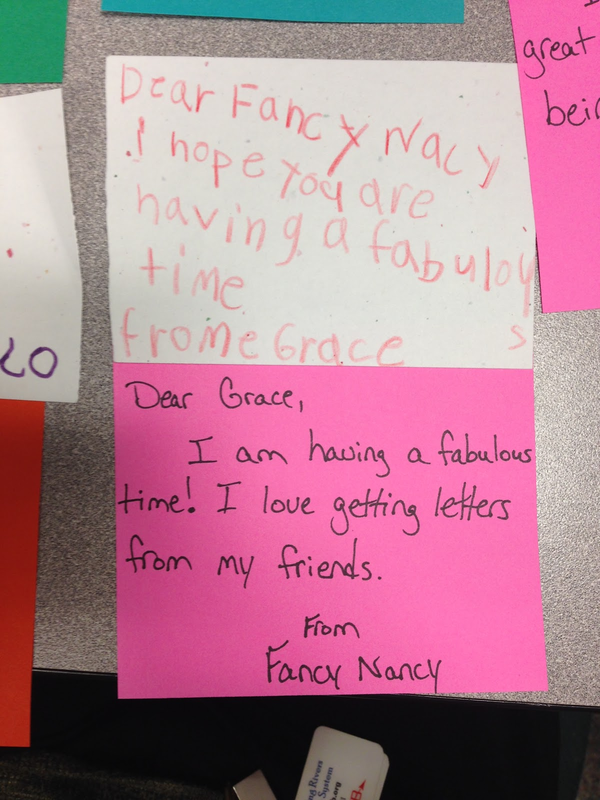 The kids just had to come to the desk and we'd give them a small piece of cardstock to write/draw their letter on. The project went well with a few people doing it the first few days. 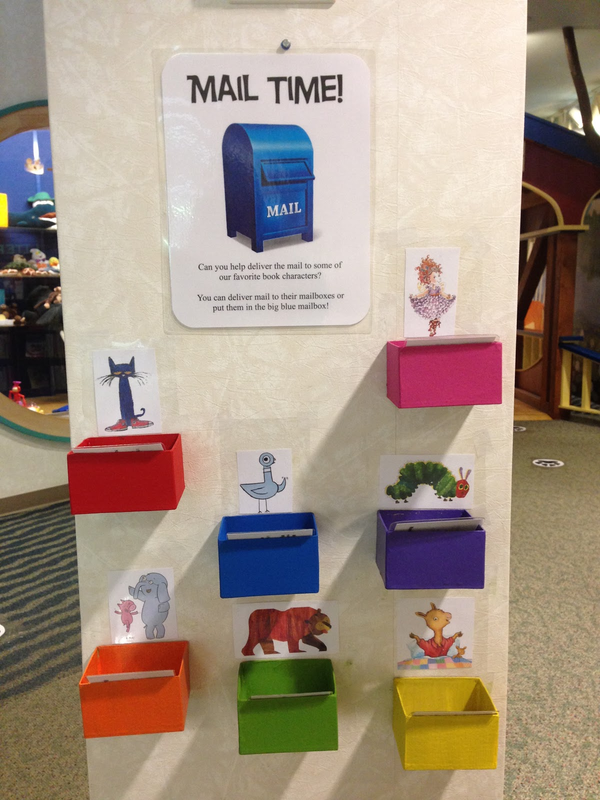 Kids would write their letters and "mail them" in our play mailbox. However, it wasn't the smash hit I was expecting. Luckily, I work with a bunch of geniuses. 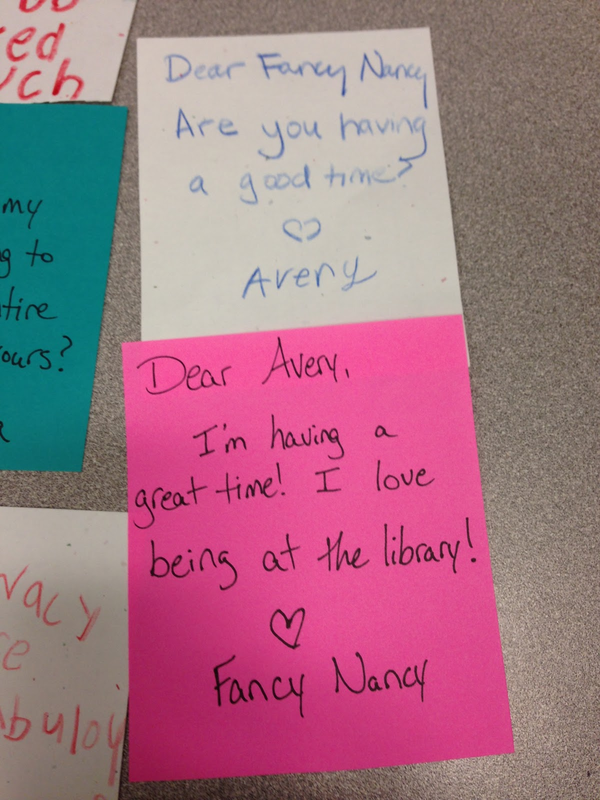 Our teen librarian, Linda, suggested having the character write back to the letter writer. This quickly became one of the greatest and coolest things we've ever done. 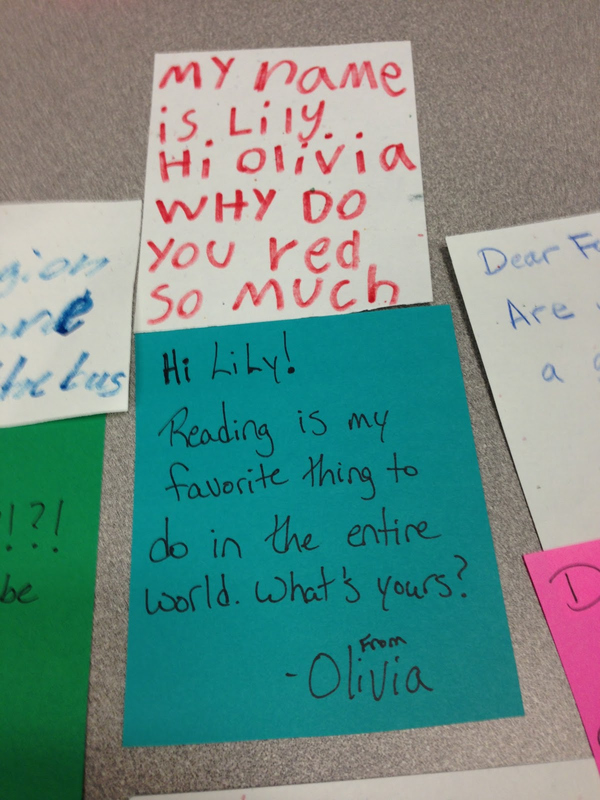 We started posting the letters on our bulletin board with the attached responses. We had over 40 letters within 3 weeks. We had a core group of about 6 kids that came back at least once a week to see what their character had said back and to write another one. We also had adults checking the board each week because they thought the letters were hilarious. 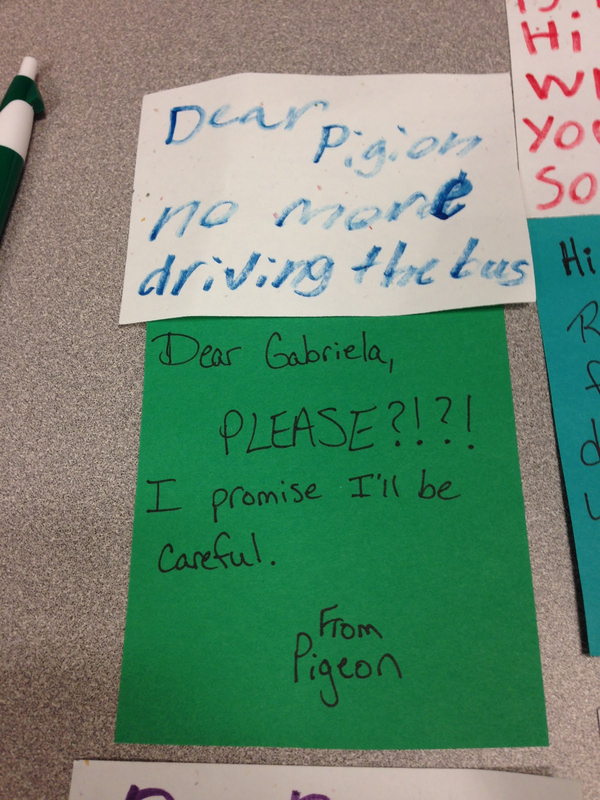 One mom told me that her kids had talked all week about who they were going to write their letter to. Another mom came up after we had taken the board down to request that we write a letter for her daughter who was very upset that Elsa hadn't written back to her. I wrote one really fast and her face lit up like I had given her a bowl of candy.